Curious about MassArt’s Studio for Interrelated Media (SIM) Department? This pamphlet was created to help you decide if SIM is the right program for you. What is SIM? The Studio for Interrelated Media (SIM) is an undergraduate Bachelors of Fine Arts major designed for student artists interested in a curriculum that supports idea-centered, interdisciplinary, and non-media speciﬁc artistic practice, alongside autonomous and collaborative working strategies and self-governance. 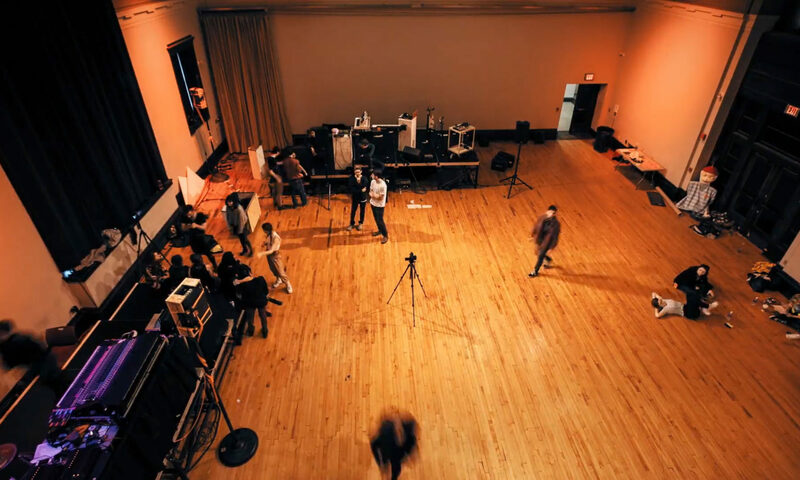 SIM majors work with experimental media, sound, light, motion, digital tools, live performance, public practice, interactive installations, event production, print and spoken word, and/or a combination thereof. SIM is a malleable and continuously re-constructed space with access to equipment and knowledge as well as pedagogical scaffolding that supports experimentation, large-scale community ensembles, and micro-personal mentoring exchanges. Through hands-on practice and visionary endeavors, the studio navigates, exposes, and processes the complexities of human existence. Ideas; SIM artists are encouraged to make their art starting from the idea and then finding the best media for expressing that idea. Community and Collaboration; these are key components of the SIM curriculum. If you a loner you probably won’t enjoy your time in SIM. Critique; each week we look at work and talk about it. The artists are expected to learn how to manage the critique to their best interests and to articulate their artistic ideas. The audience is expected to be generous, honest, and clear. Public speaking is a high priority in SIM. Live Events; SIM students make things happen. A lot. Eventworks is a SIM student run arts festival. The Godine Family gallery is a SIM student run exhibition space. The annual BIG SIM show is a student run and hugely attended student art show that includes performance, sound, video, animation, 2D and 3D and installation. Innovation; SIM is where many new media and methods have been introduced to the MassArt community (computers, internet, video, electro-kinetics, digital audio art, conceptual art). It continues to be a place where students who are working in new technologies congregate. What is the Mission of the SIM Department? The mission of The Studio For Interrelated Media is to conjure ambitious and unexpected experiences. It is to fail spectacularly, embrace chaos, invent new worlds, antagonize and enlighten, foster understanding and test limits. Every cohort shares the final challenge of redesigning the studio as a model for an alternative future. The SIM flies in the face of all that is Post Art – with humor, conflict, labor, and skill. The makers and thinkers that discover SIM may be anti-establishment and rebellious, community organizers and entrepreneurs, hyper-focused or renaissance thinkers – all ready to discover the potential of their own volition. They are hungry for a practice of transformation and yearn to redefine what art can be now. SIM fosters opportunities for individuals and collaborations to understand our contemporary situation as an open system that invites re-imagination, restructuring and re-invention. The mechanism for this transformation is the weekly SIM Major Studio course (MPSM276, 376 and 476). This class is community-powered, taking group initiative to program, produce, critique, organize and self-govern each meeting under faculty guidance. This course gives students the chance to work alongside their colleagues at all levels (sophomores, juniors and seniors) every semester while in the program. It gives students a rare and unique opportunity to experiment, to fail, to succeed – students own the process of their educational journey and leverage this experience once they graduate. They are exposed to the “real world” while they are still in school as they learn their craft, develop their ideas, and solidify their desires. Additionally, SIM majors are required to take a SIM elective every semester of their choice that focuses on a particular skill that aligns with their educational plan. Need to be able to participate in many hours of social interaction, collaboration, talking, listening and participating in group work. SIM majors are expected to respectfully listen to others and stay engaged in class work even when it is not of direct interest to the individual. Need to be able to manage their time, to set and meet their own deadlines, and/or be prepared to work regularly with a time management coach in the Academic Resource Center (ARC). Need be more interested in making things happen than making things. Need to be flexible and able to manage quick transitions, ambiguity and surprise. Need to have a willingness to translate ideas between mediums. In other words, if you have a 2D practice you will be expected to expand to other dimensions and time scales during your time in the major. Need to be self-motivated and not dependent on prescriptive assignments to make art. Need to be an independent, inventive and expansive thinker. Need be able to use, or learn to use, digital forms of information exchange, authoring, storage and project management (image editing, video and sound editing, google drive, social media, etc). Need to be good self-advocates and willing to seek out appropriate resources that support student success such as the Academic Resource Center (ARC) and the Counseling and Wellness office. Should expect loud noise, bright lights, disco balls, and roller skates from time to time. I don’t really know what I want to do as an artist… is SIM for me? While the SIM program is a great place for experimentation, it is not a great place for those that don’t yet know what they want to pursue as an artist. SIM works best for those that are self-motivated and already have ideas about what they want to express artistically. They may not yet have the skills to do it, but their ideas are burning a hole through their minds! For example, if all of your portfolio and art work is based on specific assignments, and you have a hard time coming with your own ideas, SIM may not be a great place for you. On the other hand, if you get really excited about ideas (like you have an instagram page dedicated to images of street signs named after revolutionaries and you want to make an installation out of leaves) and enjoy the process of figuring out how to approach it through art, SIM might be a great fit. Can I work in any media while a SIM major? Yes, but since SIM students are not assigned their own studio space and if you are primarily a painter or sculptor, you may want to consider being a 2D or 3D major and taking any one of the many SIM electives to have an interdisciplinary experience. An important part of SIM is experimentation with different kinds of media. If creating something that activates sight, sound, hearing, and other senses excites you, you may thrive! If you visualize yourself working in one medium and really want to focus and get better at that one thing, you may be frustrated in the program. Many students enjoy the challenge of double-majoring in more hands-on majors to supplement their work in SIM. I have lots of ideas for art-making but I don’t know how to make them happen. How will I get these skills as a SIM Major? In SIM, all the majors meet in the Major Studio class to share work, collaborate, participate in critique, and learn about production. Alongside the major studio, you are required to take at least one of the SIM electives. Each semester several SIM electives are offered that explore topics like web art and digital distribution; video editing and production; interactive media and computer-controlled installations; movement and performance art; the interrelationship between art and science; stagecraft and lighting; or sound performance, composition, recording, and editing. Within these electives you would learn and practice the skills you need to make your art. Most of our electives focus on conceptual development, audio-visual and web technology, performance, and pre and post cinematic techniques. For this reason, primarily graphic artists or sculptors often have a hard time finding their way unless they are open to new ways of expressing their ideas. Also, advising plays a large role in your SIM curriculum – it’s important to talk to the SIM faculty about your electives and let them help you make a effective choice. What will I learn in SIM? What will I do with a degree in SIM? Students that graduate from SIM are uniquely prepared for lives as self-motivated artists as well as professionals in many commercial and non-profit fields. SIM grads have started their own galleries or work as curators for established museums and galleries, TV shows, and businesses; worked as non-linear film and sound editors in Hollywood, New York, and Boston; as stage managers and crew for theaters internationally; as web developers for award-winning studios; as educators at Harvard, Stanford, Mills, Carnegie Mellon, and the New England Aquarium; and as practicing, exhibiting, and/or performing artists around the world. I’m still unsure about SIM. What should I do? You can sit in on the Thursday major studio class, schedule a meeting with SIM faculty, and speak with SIM students. If possible, come to the Fall SIM BIG Show or the Spring SIM All School Show. Get to know our department before you decide! > Participate in the work that benefits the program (volunteer jobs, be stewards of the spaces, SIM meetings). > Respect each other by being open, honest, tolerant and patient. > Engage in the evolution of the SIM community – if you are dissatisfied with something, work towards an improvement that will transform your concern for the better of all. > Follow Studio Management space and equipment usage policies, including returning equipment on time and reporting theft/damage. Leave no trace and/or leave the space better than you found it. > Have the courage to ask for help when you need it. > Take ownership of your own educational path at Massart. > Trust your own curiosity. > Take time management seriously. >Be willing to seek out, rather than fear, criticism. >Explore discomfort and disruption through art making. >Manage the consequences of risk taking. > Listen respectfully, without interrupting, while attempting to understand the perspective of others. > Criticize ideas, not individuals. > Commit to learning, instead of debating. Comment in order to share information, rather than to persuade. > Avoid blame, speculation, and inflammatory language. > Allow others the chance to speak. > Avoid assumptions about any member of the class or generalizations about social groups. Do not ask individuals to speak for their (perceived) social group. > Expect that at times, content shown by faculty, students, and/or visiting artists may address and/or contain strong language, violence, sexual content, racial and gender inequity, and other representations that may challenge or trigger you. The SIM curriculum is designed with the belief that tension, conflict, and discussion have the potential to become valuable learning opportunities. If you find yourself in a situation that is too much for you to handle and you feel you have to leave the classroom, please communicate with faculty as soon as you are able. Often, interesting discussion, disagreement, and revelation come after the challenging content is presented. SIM, the first undergraduate fine arts program of its kind in the country, was founded in 1969 influenced by the history of the educational experiments of A.S. Neill’s progressive Summerhill School (1921-present), the Black Mountain College (1933 – 1957), the Experiments in Art and Technology (E.A.T.) project (1967), as well as developments in the art world in the early 60’s that advocated the dematerialization of the art object and launched Performance Art as a genre. Many of these foundational principles still infuse the current manifestation of the program today. SIM has remained at the cutting edge of artistic experimentation for over 40 years. Elaine Buckholtz (elaine.buckholtz@massart.edu) – office hours: Tuesdays 6:30 – 7:30 pm, Thursdays 11 – 1, room N173. Or by appointment. Dana Moser (dmoser@massart.edu) – office hours: Mondays 12 – 1, Wednesdays 12 – 1, room T720, and Thursdays 12 – 1, room N173. Or by appointment. Juan Obando (juan.obando@massart.edu ) – office hours: Tuesdays 1 – 2, Thursdays 11 – 1, or by apt, room N173. Or by appointment. Nita Sturiale (nita.sturiale@massart.edu) Dept. Chair – office hours: Tuesdays 1 – 3 & (non-governance) Wednesdays 1:30 – 3, room N173. Or by appointment. Please email Nita Sturiale, SIM Department Chair, nsturiale@massart.edu with any questions or to schedule a visit.